With the present Information, we would like to provide help to our clients who submit foreign currency payment order at KDB Bank Europe Ltd. (hereinafter: Bank) to account kept with other bank in Hungary or with foreign bank (abroad) and - in the absence of experience – who would like receive information on for example what kind of transfer order form shall be filled in, when the order will be executed and completed, and what kind of cost bearing methods can be applied etc. 1.What is the difference between BIC and SWIFT codes? The BIC code (Business Identifier Code) is the bank identification number of the beneficiary’s payment service provider, which is obligatory to be provided for easier, faster and unambiguous identification in case of every foreign currency interbank transfers, except for SEPA transfers following October 31, 2016. The BIC code is managed and registered by SWIFT (Society for Worldwide Interbank Financial Telecommunications) - there is no difference between BIC and SWIFT codes. The SWIFT code consists of 8 or 11 characters. FW/ABA (Fedwire, ABA-number) – bank identifiers in the USA. It can be initiated by submitting a filled-in paper-based foreign currency payment order or by an order registered and sent by the International payment order menu via electronic channels (KDB NetBank, PC Kontakt). SEPA is an acronym for Single Euro Payments Area. SEPA is a joint integrated European payment service for sending and accepting bank transfers denominated in Euro within the territory of the European Economic Area with applying common financial schemes, standards and procedures. 4.How does SEPA transfer differ from the standard foreign currency transfer? The commission fee cannot be deducted from the amount of the order, so the total amount shall be initiated and credited to the account of the beneficiary. 5.In which cases can SEPA payment method be used? The payment service provider of the payee is direct or indirect SEPA member bank. The transfer was not submitted with urgent execution (urgent payment order). 6.In which cases is it mandatory to use SEPA transfer? Following October 31, 2016, the Bank can executes EUR denominated payment orders (except: intrabank and urgent transfers) within the EU – including Hungary- only as SEPA transfers. Therefore, these types of transfers shall meet the requirements determined in point 5. In case the client did not choose the „SHA” cost bearing method, but the order otherwise meets the requirements of the SEPA transfer order, the Bank will not reject the order, but it will executes it in accordance with legal requirements – with SHA cost bearing. 7.What kind of form shall be filled in in case of SEPA transfer order? Form regarding foreign currency payment order shall be filled in, and in case of SEPA transfer sent via electronic channel, International payment order menu item shall be chosen, so the same form shall be used as in case of other foreign currency transfer orders. 8.In which menu item can the SEPA transfer order be recorded via electronic channels? There is no special, differentiated menu item for SEPA transfers in none of the electronic channels. SEPA transfer order can be recorded in the International payment order screen. Based on the data of the submitted order, the Bank determines that in what kind of clearing system it will be forwarded. Detailed information on the method of recording (with screens) is available on our website. IBAN is an acronym for International Bank Account Number. Its length and structure vary by country (according to the Hungarian standards, it consists of 28 characters), but in every case it starts with the two-character code of the particular country. In addition to EEA countries, other countries – not just European countries- use IBAN as well. The application of IBAN facilitates the automation of cross-border payment transaction processing. Although the mandatory use of IBAN is prescribed only in case of SEPA transfers (See also point 5), it is strongly recommended to use it in every case when it is possible. Regardless of the target country of the transfer, if the transfer partner has an IBAN, that number shall be given. If you transfer to a country, where IBAN is used, but the beneficiary’s account number was not entered in IBAN format, the bank of the beneficiary either can charge a premium for the execution of the transfer, or may even reject the execution of the order. 10.What does IBAN-ONLY stand for? Following October 31, 2016, the use of the international bank account number (IBAN) is sufficient and mandatory, the indication of the BIC (SWIFT) code of beneficiary's bank is not necessary in case of SEPA foreign currency transfer orders. 11. Does the Bank execute direct debit in EUR? The Bank does not undertake the execution of direct debits in EUR. 12.What kind of certificate is issued by the Bank in case of SEPA transfers? Bank certificate is issued by the Bank. SEPA transfers are forwarded XML file format, therefore, after October 31, 2016; the Bank will be unable to provide SWIFT copy about these transfers. 13.With what value date is the SEPA transfer order fulfilled? 14.Is there any difference between the fees regarding SEPA and other foreign currency transfers? The Bank uses the same remuneration in case of SEPA transfers as in case of other foreign currency transfers. External (interbank) foreign currency transfer fees included in the chapter Financial services of the relevant List of Conditions are applied depending on how the order was submitted. 15.Is there a possibility of faster execution of foreign currency transfer? The client can submit any kind of external foreign currency transfer order with urgent execution (urgent payment order). The urgent execution is carried out based on a special assessment, evaluation. In this case, the order is fulfilled sooner than the relevant deadline determined in the respecting chapter of the list of conditions, e.g. : in case of EUR denominated transfer orders directed to an EEA member state, the order is already started and processed in the TARGET2 system on the day of receipt, if the order is taken over and accepted before the respecting deadline. The Bank charges a premium (extra cost) according to the list of condition for the urgent transfers. 16.What rules apply for completion deadlines? The Bank shall start –unless otherwise agreed- the execution of transfer orders in the currency of a country which is outside the EEA to a state outside the EEA or to Hungary (domestic transfer) or to other EEA country at the latest on the business day following the date of receipt. If conversion is required between the currencies during the execution of a payment order, where either of the currencies involved is of a non-EEA Member State or the payment order is to a state outside the EEA, the time limit for execution is extended by two business days. In case of domestic payment transactions in forint that does not involve any currency conversion; the payer’s payment service provider ensures that the amount of the payment transaction is credited to the account of the beneficiary’s payment service provider at the latest within 4 hours after acceptance. In case of paper-based payment order, the time limit for fulfilment is extended by one business day. In case of payment transactions in euro without conversion, or payment transactions involving only one currency conversion between the euro and the forint within EEA, or intra-EEA payment transactions involving only one currency conversion between the euro and the forint, provided that the conversion is carried out in Hungary and the intra-EEA transfer takes place in euro, the payer’s payment service provider ensures that the amount of the payment transaction is credited to the account of the beneficiary’s payment service provider at the latest by the end of the next business day following the day of acceptance. In case of paper-based payment order, the time limit for fulfilment is extended by one business day. In case of other intra-EEA payment transactions in any if currencies of EEA Member States besides those which are listed in point 2 and 3, the payer’s payment service provider ensures – based on the contract between the payer and his/her payment service provider- that the amount of the payment transaction is credited to the account of the beneficiary’s payment service provider at the latest by the end of fourth business day following the day of acceptance. 17.What cost bearing methods can be applied in case of initiationg foreign currency transfers? SHA (shared costs) – means that charges are split between sender and beneficiary. The payer's bank will charge the payer a fee for the payment orders, while the beneficiary pays the charges of any intermediary bank and those of his / her own bank. OUR – The payer bears also the costs of the beneficiary’s payment service provider and those of any intermediary bank in addition to his/her own costs. Usually, the sending bank will levy a flat fee for third-party charges and the payer will know the cost before transfers the money. However, our experience shows that in practice it can still happen from time to time that some intermediary bank charges a fee and deducts it from the amount transferred. So, it seems advisable to provide as detailed information for the transfer as possible (e.g. also your intermediary bank details) to reduce this risk. BEN (beneficiary) – The beneficiary bears all bank costs relating to payment transactions, so the costs of the payment service providers of the payer the beneficiary and that of the intermediary bank as well. This means that the recipient will receive an amount that is lessened by the fees applied by all parties involved. The sender should therefore add the amount of these fees to the original transfer sum so that the recipient will receive the full payment. The payer and the beneficiary shall pay only the fees and costs determined by their own payment service provider (SHA). This rule is applicable for the execution part within EEA. Point 1 shall not be applied, if the headquarters of the beneficiary’s payment service provider is not located in an EEA state (SHA / OUR / BEN). *This rule is applicable for the execution part within EEA. 18.Is there a possibility of file upload carried out from accounting system? Currently, our corporate clients have the possibility to import foreign currency transfers in EDIFACT format file via KDB NetBank and PC Kontakt electronic channels. In case of corporate clients which are larger than micro enterprises, if they request, they will have the possibility to upload SEPA transfer orders in UNIFI ISO 20022 XML format. The Bank ensures their clients the possibility of SEPA file upload in a dedicated user interface. The Bank makes available the description and other documents of the related file for these clients of the Bank based on request. 19.What is the difference between the currency of the amount and the currency of the execution? The currency of the amount and the currency of the execution shall be provided in the electronic channels during recording foreign currency transfers. What is the difference between the two currencies? 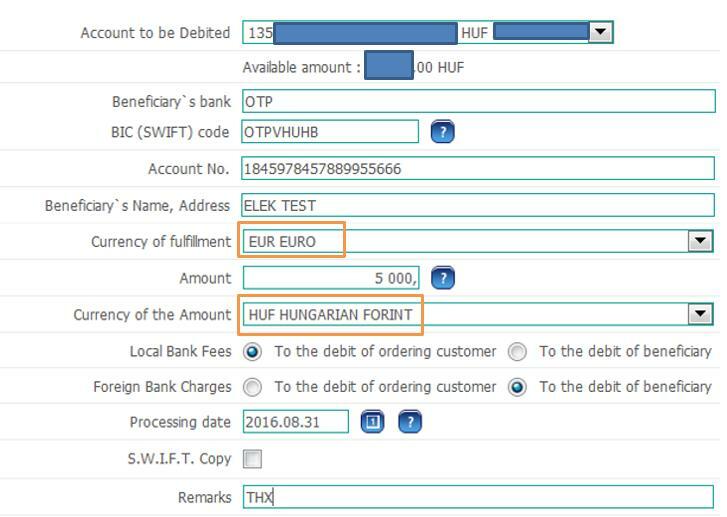 As it can be seen, the account to be debited is a HUF account, the execution is carried out in euro and the amount was given in euro (200 EUR) by the client as well. Example 2: The same client borrows 5,000 HUF from his colleague, and he/she would like to transfer back the amount. The colleague asks him/her to transfer back the debt in EUR, because he/she is going on holiday (abroad), and he/she needs EUR anyway. In the above example, the account to be debited is a HUF account, and the execution is carried out also in euro as in the previous example, but the client set the amount not in EUR but in HUF. As it can be seen from above, if there is no conversion during payment transaction, the currencies of the account to be debited, the amount, and the execution are the same. If the order is submitted with conversion, these currencies may differ, but the currency of the amount shall be the same either as the currency of the account to be debited or the currency of the execution. 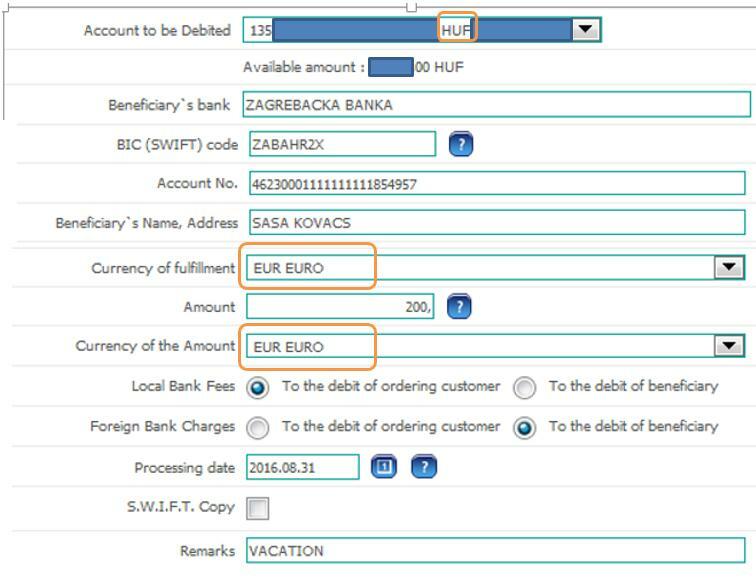 If the client submits HUF transfer order to the Bank for a foreign beneficiary (account kept with foreign bank), a third, Hungarian bank beside the payment service providers of the payer and the beneficiary takes part in the transfer process – as in a foreign currency transfer process-, which is the forint nostro (nostro account – the foreign account keeper of the payment service provider, in the local official currency) account keeper of the beneficiary’s bank. Due to the above, the technical execution of the HUF transfer abroad is carried out with VIBER system. The HUF transfer abroad can be submitted only by filling in a paper-based form. If the client request – or based on legislative provisions-, there is a possibility to deduct the fees and costs of the payment services from a determined payment account of the client by the Bank, in that case as well, when the execution is carried out in another account. Currently, in case of foreign currency transfers, the payer indicates these types of requests in the field of remarks of the transfer order. However, following October 31, 2016, in case of SEPA transfer order sent via electronic channels, messages, requests written for the Bank in the remark box cannot be processed because of launching the automatic processing. Therefore, if the client does not have enough coverage in his/her account to cover the commissions, he/ she has the option as described above, or he/ she needs to ensure the amount of the commission as well in the account to be debited. The value dates of foreign currency transfers may differ from the value dates determined in the respecting List of Conditions depending on the Hungarian non-working days, and bank holidays in the currency of the payment transaction. The forex holidays – about which the Bank sends notice in advance via the electronic channels and which are published on the Bank’s website as well - are not considered business days regarding the foreign currency concerned by the Bank in case of outgoing and incoming foreign currency transfers during calculation of the fulfilment day. If you have any questions regarding the present Information or you do not have access to any of the documents or information referenced herein, you can contact any of our Branches or call our Call Center +36 1 473 4440, where our colleagues are ready to handle any and all of your disposal needs. Furthermore, please note that information disclosed in the present Information are not complete, they may change periodically; therefore, please, continuously monitor the modifications of the present Information, and the documents and information indicated in it. It is also suggested to inquire in detail into the information concerning changes in each case.